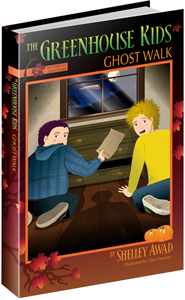 We are pleased to announce the release of the 2nd mysterious adventure, Ghost Walk, in The Greenhouse Kids series of books written by Shelley Awad and illustrated by Glen Hawkes. Ghost Walk continues the story of the 1st mysterious adventure, Dan Delion's Secret. Before The Greenhouse Kids can plant Lucinda the Ladybug's special seeds they must first solve a riddle. Solving the riddle leads them back to the English Ivys' haunted mansion where they must now solve another mystery. Find out who they had to meet at school, what was in the seed packets, and who was in the haunted mansion. For children aged 8 to 12. The books are expected to be shipped out to us by the end of April. To order your signed copy, please visit www.greenhousekids.com or call toll free 1-800-665-2124. Dan Delion's Secret - Dan Delion sets out hunting bugs, and discovers a secret that is much too big to keep to himself. He shares his secret with the other Greenhouse Kids, Holly Hocks, Johnny Jump-Ups and Foxy Gloves. 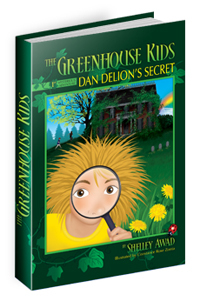 The Greenhouse Kids never imagined the mysterious adventure that was about to unfold. Part mystery, part educational, this charming gardening-themed tale will appeal to children aged 8 to 12. Parents might even learn a thing or two! Book launch details to follow. April 21st - School presentation at Harrow Senior, Harrow, Ontario 12:30 p.m.
April 22nd - School presentation at Linden Park Elementary, Hamilton, Ontario. Student book presentation 1:30 p.m. until 2:15 p.m. Parent greenhouse presentation at 7:10 p.m. until 7:35 p.m.
April 25th - Earth Day Celebrations with Enviro-Expo 2010. Come out to the Earth Day Tree Planting Celebrations at Malden Park, Windsor, Ontario from 10:00 a.m. until 3:00 p.m. The Greenhouse Kids book presentations will be at 11:30 a.m., 12:30 p.m. and 1:30 p.m.
May 8th - Chapters, 428 King St. N., Waterloo, Ontario. Book signing from 1:00 p.m. until 3:00 p.m.
May 15th - Chapters, Devonshire Mall, Windsor, Ontario. Book signing from 1:00 p.m. until 3:00 p.m.
May 29th & 30th - Come out to the Garden Tour hosted by Fort Malden Horticultural Society. A book signing will be held at the Garden Fair located in the Amherstburg, Ontario arena, Saturday 10:00 a.m. until 6:00 p.m. and Sunday from 10:00 a.m. until 4:00 p.m.
June 5th & 6th - Art in the Park, Willistead Park, Windsor, Ontario. Book signing 10:00 a.m. until 5:00 p.m.
June 12th - Chapters, 1037 Wellington Road, London, Ontario. Book signing 1:00 p.m. until 3:00 p.m.
July 1st - The Amherstburg Ice Cream Festival, Amherstburg. Book signings from 10:00 a.m. until 4:00 p.m.
July 16, 17 & 18th - Sunsplash Festival 2010, Optimist Park, Belle River, Ontario. Book signings and presentations from 10:00 a.m. until 6:00 p.m.
August 28, 29th - Amherstburg Art by the River, Fort Malden National Historic Site, Amherstburg, Ontario. Book signings 10:00 a.m. until 5:00 p.m.